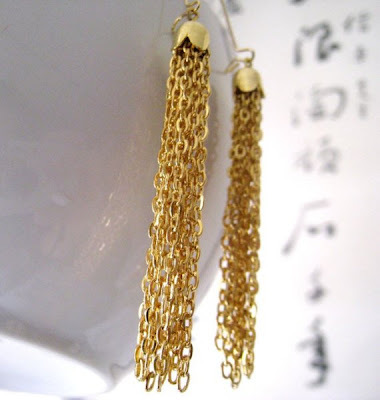 Gorjana's gold vintage chain tassel earrings retail for $48 at Revolve Clothing. Lunashineshine's Etsy shop has an incredibly similar pair of earrings which retail for a very low $12! Click HERE to visit the earring page and click HERE to visit her Etsy store. omg so similar and BETTER ...these are super easy to DIY as well. Nice find! I have some earrings like these, but silver. Could you help me style them? I'm a teenager, and my mom said these types of earrings should only be worn with formal dresses....Help? Audrey - Thanks for your request! I will be posting some outfits for you on Saturday. Those earrings are so versatile, you should definitely be able to wear them more often! Alright, thank you so much! I've been wanting to ask you that for a while, but never got around to it. I really appreciate it!